This is an extraordinary film based on the extraordinary memoir of Jean-Dominique Bauby, well-known in France as a journalist, author, and editor of ELLE fashion magazine. Not only are the contents of Bauby’s memoir extraordinary – but the way in which he wrote it is extraordinary too. This is the basis for the film, The Diving Bell and the Butterfly. Director Julian Schnabel shows he has not lost his ultra-tender touch with this film. It surpasses – on all levels – his earlier excellent effort, Before Night Falls (2000), which stars Javier Bardem. Do yourself a favour: don’t watch the trailer below. Go and find a copy of this film, and a box of tissues, and settle in with a bottle of wine for a remarkable bitter-sweet tale, brilliantly told. 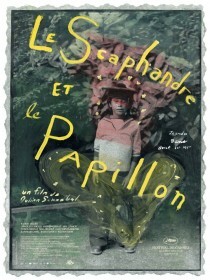 You can find more information on this French movie on Wikipedia and IMDb. As always, I recommend you don’t ruin any surprises by reading spoilers or watching trailers. Having suffered a brain stem stroke (just as is exampled here) and thankfully being spared locked-in syndrome, this moving biopic is proof of the power of catharsis that movies can provide. Thank you for the post and the review therein. You are most welcome, Mr Bailey. I love your writing on your blog, havingbeensaid.wordpress.com. You’ve got a unique tone with which you use eloquently to comment on many of life’s truths. Kudos to you! I hope you are doing as well as possible given the circumstances. We are sending you magic hugs from over here. Indeed an extraordinary film! It took me some time to get into it but it was worthwhile. Strongly recommended! Thanks for commenting, Dadda. Always good to hear from you! I read the book, hope the movie is decently good. I will definitely read the book after seeing this marvellous film. I highly recommend you watch it. Yes, the film was wonderful.